Antonio ‘Jojo” Sescon, an artist, activist, environmentalist. Jojo grows a garden of roses after graduating from high school and started expressing through painting. But time made a twist and he decided to drop his brushes and paints and left home to become a photojournalist. His coverage on Mindanao insurgency lasted until 1988. An eye for compositional clarity, he got this talent from his mom who was a photographer after the WW II. A veteran in the mountain trails armed with his camera, he was invited by Canadian film director Nettie Wild to the team working for the documentary “Rustling of Leaves: Inside the Philippine Revolution” as 2nd cameraman in 1986. The film won the Toronto International (Canada) and the Berlin International (Germany) Best Documentary Film Awards and in Canadian Society of Cinematographers Award for Best Cinematography in Documentary. 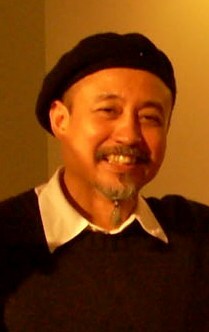 Later on his own, his avant-garde storytelling earned him as multi-awarded director, author and cinematographer for his works on social and environment issues for ” Think Like a Mountain”, “Bitter Sugar”, “Yuta”, and “Mumunting Krus”. His screen name, Hesumaria is as apt an expression as it is a symbol of highly developed pieces. Works-in-progress include personal experiences and agrarian reform struggles. Jojo’s collection of shells, musical instruments and mementos during his travels adorns his Buho-Kubo in hometown Iligan. Adventures for him are not without a search for bonsai materials and shrubs, and his green thumb hasn’t failed a bit. He experiments with herbs in his cooking, and is in cloud nine to discuss yogurt, blue cheese and kimchi among others. As a sculptor, he partnered with internationally known sculptor Julie Lluch for several public monuments all over the Philippines from 1990-2007. His ‘Recess of the Inner Psyche’ series in Manhattan, NY, in December 2007 is loaded with passion, a glimpse of the artist’s inner landscape. In his portraiture works, are expressed, the deep respect to capture the personality of the subjects, with the bias of an art director. His select portraits and ten works for the ‘Tears of Joy’ series, a playful composition of tear forms, awere exhibited at the Misamis Oriental Provincial Capitol Art Gallery for February 2010, and at the Museum of Three Cultures of Capitol University in May 2010. Giving back to the community, Jojo implemented under his brain-child Urian Arts Center, “Hasaan”, an outreach program which brings after-school arts appreciation sessions to underserved communities. A clay workshop with the beneficiaries of Gugma Sa Kabataan, an NGO working for street children in Cagayan de Oro City is on-going. Heartwarming though a threat to safety, Jojo is without the continued search for adrenalin rush. He is now doing preliminary activities to facilitate a clay workshop with selected communities around war-torn Cotabato. This is a healing therapy workshop and at the same time improving livelihood opportunities for the community. Multiple facets of this project may take long to organize, but he is already excited of this contribution. Home base is Cagayan de Oro. As he starts to build his studio, he initiates reaching out to the neighbors: giving an art scholarship to deserving neighbor-students, aimed at having local arts presence with community participation. This jump-starts the Community Development Grant Program of the Urian Arts Center in August 2010. Still under this program is the current screening for clay sculpture apprenticeship for art enthusiasts who are interested but lacks the resources. Intentionally a health buff to support the very physical work in most of his sculpture pieces, he walks miles, swims, eats healthy most of the time, and is unsympathetically at ‘war with plastic’. Behind a smart and graceful person is an intense perfectionism, Jojo does not settle for anything less. When engaged, this artist, activist, environmentalist, is just one plain passionate person.